Alois Alzheimer was a German neuropathologist who first identified a form of dementia that would become known as Alzheimer’s disease. Capricorn Research has a collection of 737 birthcharts of Scientists and the most common Sun sign is Gemini with a statistically significant score of nearly 40 percent above the expected rate. The most frequently occurring aspect amongst these scientists is the Sun in conjunction to Uranus with a 35 % rate above the norm. This is hardly surprising given that Gemini is a rational Air sign that specialises in observation, comparison and communication and Uranus is about the inspired, intuitive thinking that is required to make new discoveries. 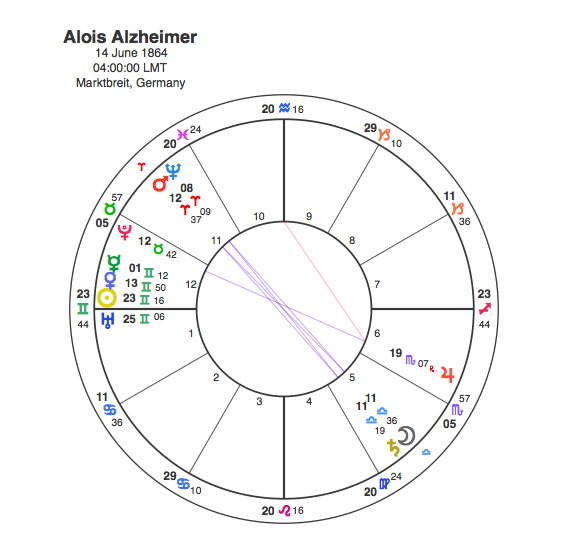 Alois Alzheimer was a great medical pioneer who had not only the Sun and Uranus in very close conjunction but his Ascendant as well, all contained within 2 degrees of Gemini. Alzheimers disease is a debilitating condition that affects people in old age. Saturn rules old age and the undermining and enfeebling illness would fit well with the more difficult aspects to Neptune. Alois Alzheimer has an opposition between Saturn and Neptune that is very closely connected with his Moon and Mars. Oppositions in a birthchart show areas that an individual has to explore strongly in their life. Mars in Aries opposite Moon in Libra will produce an assertive pioneering drive together with an even handed, logical response to situations. This double opposition of Moon / Saturn to Mars / Neptune is the perfect astrological significator for the man who discovered Alzheimer’s. Pluto, as we know is the planet that triggers the watershed point in a person’s life when it comes into aspect with the Sun. When the Sun is exactly conjunct the Ascendant, this transit becomes even more important. In April 1906 a patient Alzheimer had been observing died and he was able to study her brain in his lab. His work with this patient was the basis of a speech given by him on 3 November 1906 which was the first time the pathology and the clinical symptoms of presenile dementia were presented together. By 1911, his description of the disease was being used by European physicians to diagnose patients in the US. Pluto was conjunct Alzheimer’s Sun and Ascendant from the summer of 1906 to Spring 1908. This was the only major aspect that Pluto made in his life.